For more than twenty years RenovarÉ has pioneered the use of spiritual classics for deepening our lives of discipleship. Their highly praised compendiums Devotional Classics and Spiritual Classics have sold 500,000 copies. 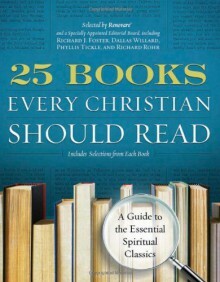 Now they have put together a prestigious editorial board and polled respected Christian leaders and thinkers from a variety of Christian traditions, including Catholic, Orthodox, and Protestant, to present the twenty-five most spiritually influential and important books for Christians to read. There are books that should be shaping the church, our faith, and our engagement in the world. From timeless classics like The Imitation of Christ to unexpected selections like Fyodor Dostoevsky’s The Brothers Karamazov and the poetry of Gerard Manley Hopkins, 25 Books Every Christian Should Read provides historical background for each work and explains its importance for modern Christians, while including selected readings from every book to get you started. In addition, each chapter ends with discussion questions to the work for use in small groups or for personal reflection. 25 Books Every Christian Should Read is a pivotal resource for the future of Christianity, an invitation into the fullness and richness of the Christian tradition.